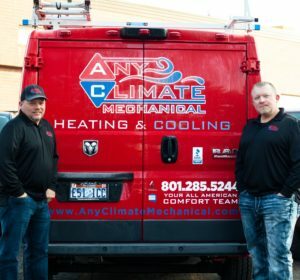 Any Climate Mechanical, LLC. is a customer focused heating and air-conditioning company that was originally started in 2015. Located in Sandy, UT, we employ highly trained people whose goal is to make our company the best service company in greater Salt Lake area.. If at any time you are not satisfied with your All American Comfort System, our service or our staff, we will gladly replace, remove or repair your system to industry specifications. If within the first 30 days you are not completely satisfied with the system performance, please let us know and we will do everything possible to remedy the problem. If we cannot meet your expectations in this time frame, we will gladly return 100% of all cost back to you and remove the system. We are the absolute best at what we do, we would like the opportunity to prove that to you. Compare our guarantee with the limitations, fine print and exclusions other companies tend to use to back their work today. Others will typically guarantee only the functionality of the equipment–not your satisfaction with the process or that the finished job lives up to your expectations. This is why Any Climate Mechanical, LLC. continues growing with more satisfied customers each and every year. Give us a call for your service needs and see what you’ve been missing. Products and services link on the website. Overview, HVAC, Air Quality, Duct Cleaning, Maintenance, Energy Savings, Residential and Commercial.